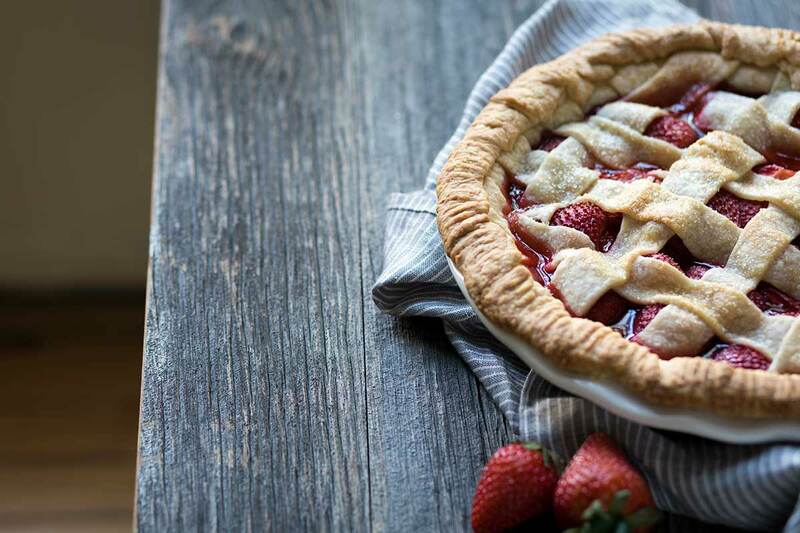 There’s no better way to celebrate strawberry season than with this sweet strawberry pie! It’s a spring and summertime favorite around here. 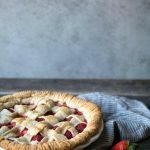 This strawberry pie recipe is simple to make and is wonderful served on its own or topped with a dollop of freshly whipped cream! This post is a collaboration with California Strawberries. Are you excited about berry season? I always look forward to this time of year because of the abundance of seasonal fruits and veggies. Strawberries are one of my favorites; you’ll find plenty of strawberry recipes if you look around the site (such as my strawberry granola yogurt popsicles). While beautiful strawberries are starting to arrive at local markets, they’re not necessarily at peak sweetness yet. 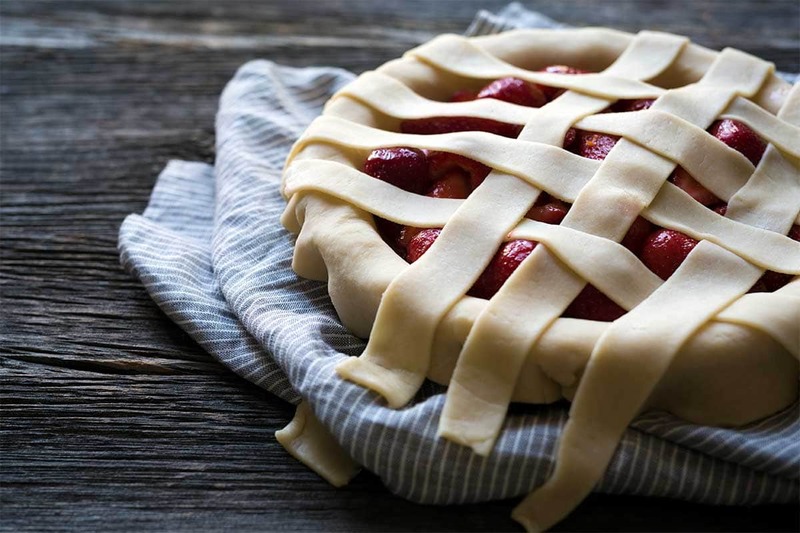 However, this is a great time to start practicing your pie baking skills and lattice technique! 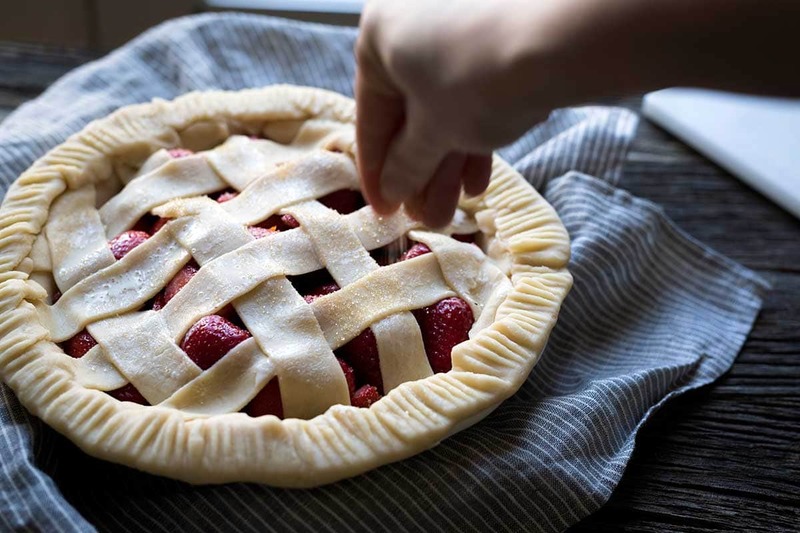 Unlike cakes, the sugar in homemade pies can easily be adjusted depending on the sweetness of your berries. 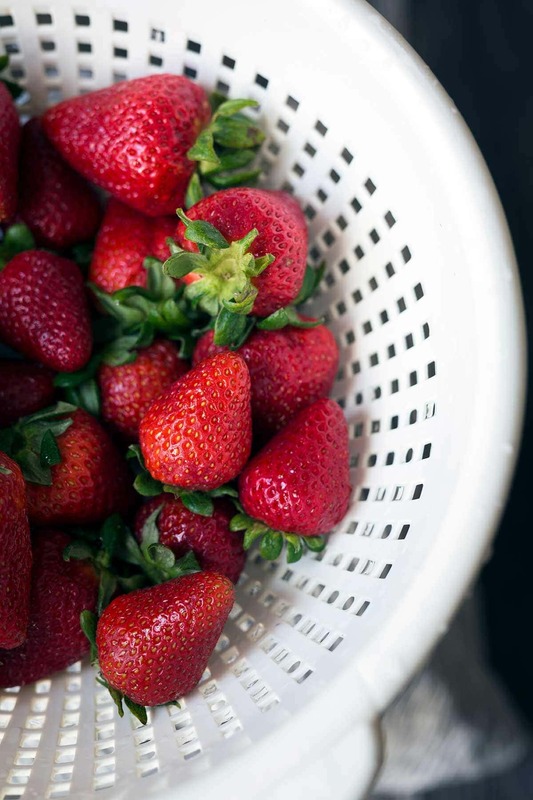 When purchasing strawberries (for recipes or snacking), you always want to look for plump, bright red berries that have no visible white shoulders or bruising, and that have a bright green calyx (top). You want to macerate the strawberries with sugar for at least 30 minutes before baking. Maceration simply means combining the berries in a bowl with a bit of sugar (and sometimes a few other ingredients like lemon juice and orange liqueur). 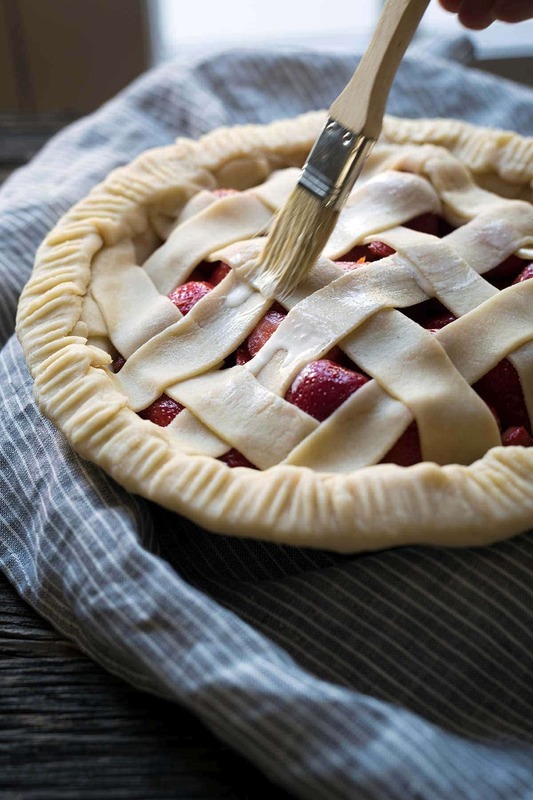 Pies typically also include a thickener such a cornstarch. The sugar draws moisture out of berries, causing them to soften. The extracted liquid combines with the sugar to create a syrup. These pie crusts look so fancy, don’t they? Want to know the secret to making this happen quickly and easily? A pizza wheel. Yep, it doesn’t matter whether you’re using homemade or store-bought pie dough (though I bet you can handle homemade dough if you are ready to give it a try). The key is to roll the dough thin and then slice thin strips. They do not have to be perfectly even. Just try to make them a bit longer than necessary so you have room to work. Start at one end, and fold over and under. You can make it tight, or leave space for the filling to show through (my preference). Once the top is finished, use kitchen shears to trim away the excess dough. Then you can crimp the ends however you like. I’m a fan of pressing everything together using a fork. This is optional but I recommend taking the extra step: brush a bit of cream or egg wash on top before baking to help brown the pie dough. Also technically optional, but awesome. Sprinkle some coarse sugar on top for crunch. After the strawberry pie has finished baking, I let it rest at room temperature for a few hours before slicing it. The juices need to settle and thicken. Once you start slicing, you’ll be greeted with a beautiful sight. A tasty one, too. You want to work with pie dough while it’s cold, but not so cold that it cracks when you try to roll it out. Let the dough sit for a few minutes after removing it from the fridge. I’ve written some more tips specifically about working with dough in Chocolate Tart with Toasted Coconut and Sea Salt recipe. If you’re not ready to take the plunge or need to save time, you can use store-bought pie dough. No judgement here! The filling will continue to thicken and set as it cools, so you don’t want to slice into the pie immediately after removing it from the oven. Let it rest for a few hours at room temperature. You may enjoy my Strawberry Bundt Cake, Roasted Strawberries and Clotted Cream Ice Cream, and Strawberry Vanilla Jam Crumb Bars. 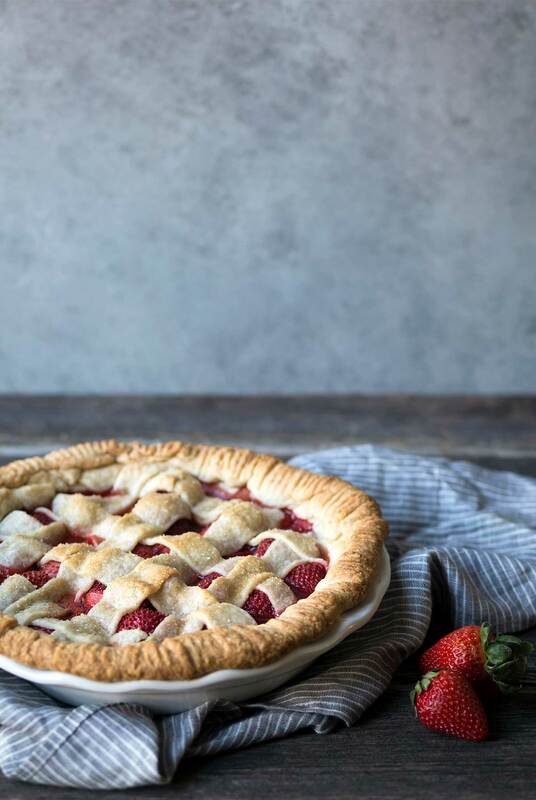 There’s no better way to celebrate strawberry season than with this sweet, decadent strawberry pie! Place the all-purpose flour, sugar and salt in a food processor and pulse several times to combine the ingredients. Add the butter and pulse several more times until the mixture looks like coarse cornmeal (a few larger pieces here and there are fine). With the machine running, swiftly add the cold water until the dough has just barely formed. It will look crumbly, but should form dough when pressed together. Divide into 2/3 and 1/3 portions, wrap in plastic, press into discs, and chill for one hour or overnight. Wash and hull the strawberries. Slice the medium and smaller strawberries in half, while slicing the larger berries into quarters. Place in a large bowl, and add the lemon juice, orange juice, zest, granulated sugar, brown sugar, and cornstarch, stirring to combine. Cover and place in the refrigerator. Allow the strawberries to macerate for 40-45 minutes, stirring periodically. You can optionally taste the liquid, and add more sugar or lemon juice if desired. (Note: there will be a cornstarch aftertaste which will go away once the pie is baked). Preheat the oven to 425 degrees F. On a floured surface, roll out the larger portion of dough to approximately 12 inches in diameter. Carefully roll into a 9 1/2 inch pie pan. The dough should hang over the edges of the pan by at least 1 inch. Add the strawberry filling. Re-flour the surface if necessary, and roll the second portion of dough to approximately 10 inches in diameter. Cut 8 even strips, and layer them in a lattice pattern over the filling. Trim off any excess overhang from the lattice, and then fold up the bottom overhang so it sits on top of the strips. Using a fork, crimp the edge of the dough all the way around the pan. Set the pie pan on a baking sheet, and place into the oven. Cook for 20 minutes, lower the oven temperature to 375 degrees F, and bake for an additional 35-40 minutes, or until the filling is bubbling and the top is golden. Strawberries will vary is sweetness depending on a variety of factors such as ripeness, location and season. Keep some extra sugar and lemon juice handy to adjust the flavors of the pie according to personal preference. For best results, look for strawberries that are bright red all the way to the stems, with no white shoulders visible. Love the simplicity and beauty of this pie. Beautiful pie Jennifer! So excited for all those fabulous summer berries! I LOVE strawberry pie! Total perfection. Nothing beats peak strawberry season. This pie Ian a work of art! 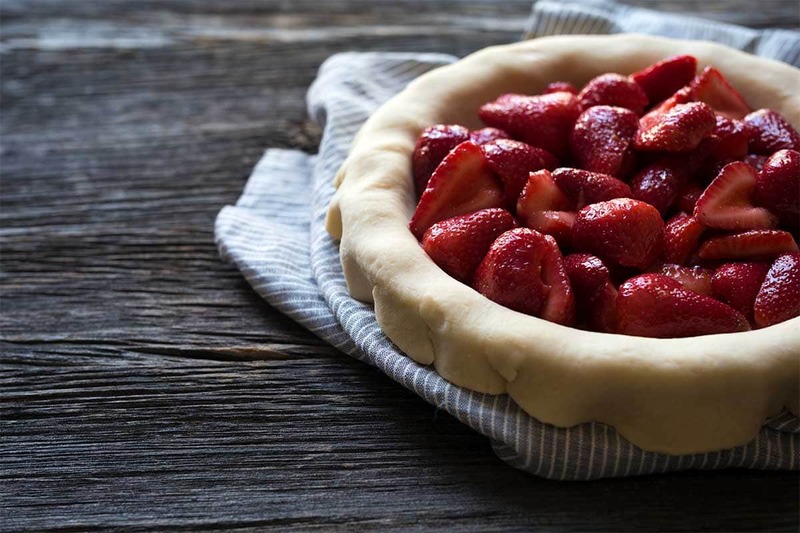 There is nothing better than strawberry season or strawberry pie! Hi Judith! I almost included a section on this but wanted to wait until I have a chance to test it. 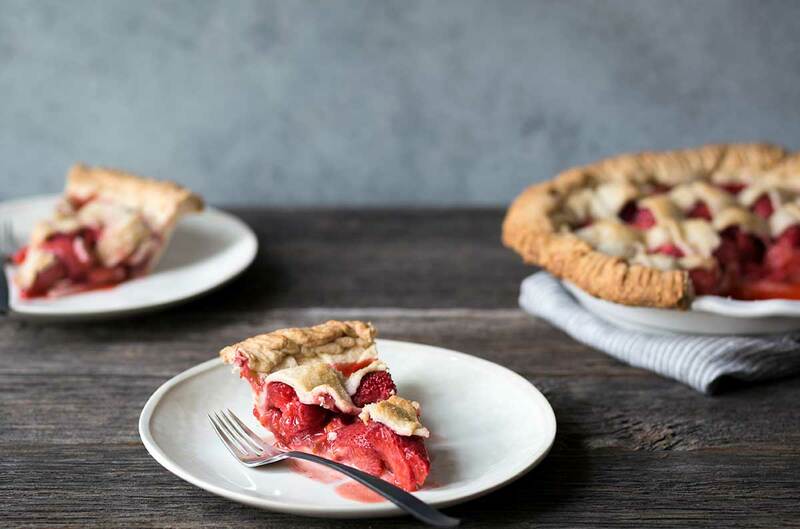 My instinct would be to cut the strawberry filling in half, then cook down rhubarb with some sugar and combine it with the macerated berries. But to be safe, I’m going to recommend you go for a tried and true recipe. 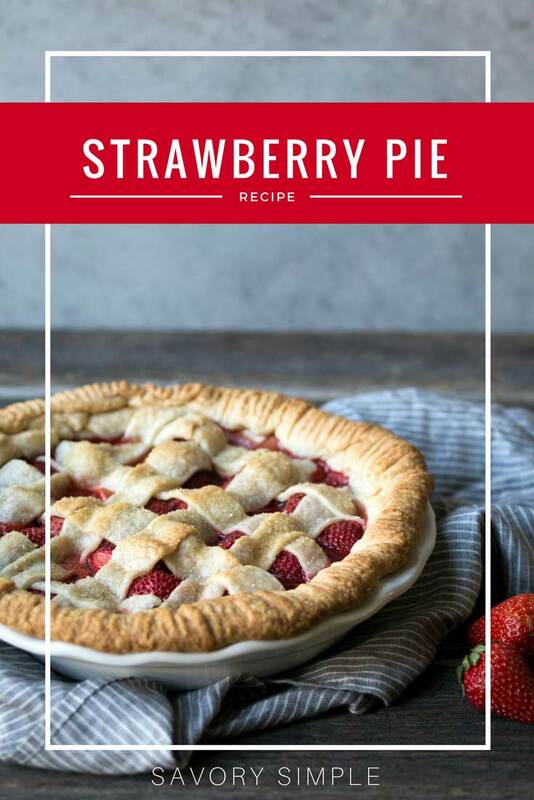 Elise at Simply Recipes has a great looking strawberry rhubarb pie full of glowing reviews. You can find it here. While her top isn’t lattice, you could still follow my instructions to get the same look. 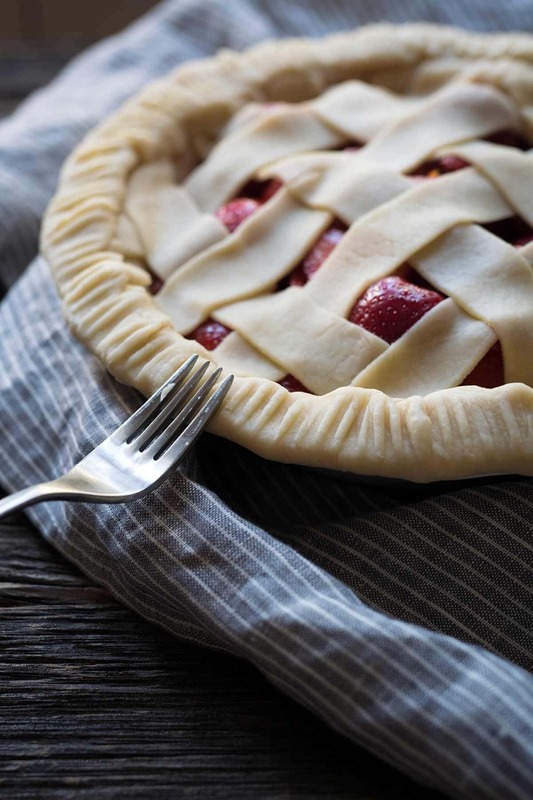 Love love love the tutorial for the lattice crust. I’ve always wondered about that. Strawberry and desserts just go hand in hand. The fresher the better!